We love WordPress. It’s so easy and versatile to use and customise. All the sites we now build are in WordPress. It is the most widely used and easy to manage content management system out there, and one of the fantastic things about it are plugins. WordPress plugins are bits of software that can be uploaded to to extend and expand the functionality of your site, and we have listed 10 Must Have WordPress Plugins to make it perfect for your needs. As a Digital / Design Agency, we’ve made a lot of websites, so we’ve collated a list over the years of the top plugins. This plugin allows to clone any page, post or custom post type – we use this all the time! Nextgen gallery is the most popular gallery plugin ever for WordPress, which is fully responsive that we’ve found to date, it’s very easy to manage and we use it for every one of our websites. OrbitCarrot CTA manager lets you create CTA (Call to Action Manger) boxes as widgets, and have full control of the look and content – it’s the only one we’ve found to date which actually links the whole CTA box not just the content. You have a choice of colours, or choose un-styled if you want to style the CTA yourself. What can we say about this? We bloody LOVE this plugin. This is a MUST for every website. Yoast WordPress SEO is the easiest SEO plugin, it tells you where you are going wrong with your SEO for each page/post and gives you useful tips on how you can improve your SEO. They have even published an online know how manual. Do yourself a favour and get this! We all should backup our websites. I have had so many clients get in contact with us after a period of time and inform us they have mucked up their website. Back it up! This is the best WordPress backup solution, it includes email backups, Dropbox and Amazon S3. Don’t forget that many dedicated WordPress hosting solutions will already include some kind of backup, or offer it as an inexpensive add-on, but these tend to be unreliable, so we have this as part of all our websites. Over a million websites use Gravity forms. There are many free form plugins, such as Contact form 7 – so why are we recommending a paid one? It comes down to usability and functionality. Gravity forms unlike Contact form 7 have an easy to use UI, rather then a collection of shortcodes and code, which make up CF7’s UI. LayerSlider WP is a premium multi-purpose slider for creating image galleries, content sliders, and mind-blowing slideshows with must-see effects, even from your WordPress posts and pages. LayerSlider comes with 13 built-in skins, and it has tons of options to entirely customise the appearance and behavior of your sliders at the smallest detail. Adds a CMS-like tree overview of all your pages and custom posts to WordPress, often when you have loads of pages in WordPress it can be difficult to find pages and see a structure. This plugin solves this issue. Within this tree you can edit pages, view pages, add pages, search pages, and drag and drop pages to rearrange the order. Multiple Content Blocks allows more content blocks in WordPress than just one. It creates columns or other page-specific content outside of the loop. Without your clients being able to screw up the lay-out 🙂 It’s a perfect plugin how adding content in between content in your sites theme. Restrict Widgets is all in one solution for widget management. It lets you control the pages that each widget will appear on and avoid creating multiple sidebars and duplicating widgets. You can also set who can manage the widgets, which sidebars and widgets will be available to selected users, which widget options will be available and how it will be displayed. This is really handy for any web developer. We have plenty of clients come to us and ask us ‘how can we make their website rank on the 1st page of Google’. First thing is first, any successful project starts with a plan. We call it a SEO Strategic Plan. We sit down with our client and ask a series of questions which help us determine what content and action plan we can create to help them rank in a good spot on Google. Search engine optimisation (SEO) is often about making small modifications to parts of your website. When viewed individually, these changes might seem like improvements, but when combined with other optimisations, they could have a noticeable impact on your site’s user experience and performance in organic search results. We recommend that you should base your optimisation decisions first and foremost on what’s best for the visitors of your site. They’re the main consumers of your content and are using search engines to find your work. Focusing too hard on specific tweaks to gain ranking in the organic results of search engines may not deliver the desired results. Search engine optimisation is about putting your site’s best foot forward when it comes to visibility in search engines, but your ultimate consumers are your users, not search engines. The below Search Engine Optimisation (SEO) customisations will be help your site. Following the best practices outlined below in this post will make it easier for search engines to crawl, index and understand your content. Create unique, accurate page titles on all your pages – a title tag tells both users and search engines what the topic of a particular page is. Improve the structure of your URLs – simple-to-understand URLs will convey content information easily. Make your site easier to navigate – the navigation of a website is important in helping visitors quickly find the content they want. It can also help search engines understand what content the webmaster thinks is important. Create HTML and XML sitemaps on your website – a simple site map page with links to all of the pages or the most important pages on your site can be useful. Creating an XML Sitemap file for your site helps ensure that search engines discover the pages on your site. Write better anchor text – anchor text is the clickable text that users will see as a result of a link. The better your anchor text is, the easier it is for users to navigate and for Google to understand what the page you’re linking to is about. Optimise your use of images – We will optimise your use of them. All images can have a distinct filename and “alt” attribute, both of which you should take advantage of. Media assets influence search rankings – i.e. photos, videos are all great ranking material. Use heading tags appropriately – heading tags to emphasise important text. There are six sizes of heading tags, beginning with <h1>, the most important, and ending with <h6>, the least important (1). Make effective use of robots.txt – tells search engines whether they can access and therefore crawl parts of your site. Outbound links – Make sure all outbound links in site are not named ‘Click here’ or ‘For more info’, but are named after your keywords. Create profiles on all small business directory sites – Such as Yelp, True Local, Yellow and White Pages. It is very helpful to fill them with as many videos, photos and reviews, this helps your ranking. Use reviews – the profiles are so powerful, everyone is comparison shopping, so it’s important to generate positive reviews. Google’s Webmaster Tools – this helps you better control how Google interacts with your website and get useful information from Google about your site i.e how many people are linking to your site, HTML problems, how fast your website is, keyword research tool and much more. Google Analytics – provides information on traffic and tracking information, i.e. bounce rates, website statistics, average visit duration and much more. Google Keyword Suggester Tools – focuses on correct keywords for your business by identifying what keywords your site ranks for. Create a Google+ account – content posted on Google+ is crawled and indexed far quicker than on competitor sites. The most straightforward way Google+ impacts search rankings is with personalisation. For example, if someone is following you on Google+, the chances that they will see your posts in Google’s search results go way up. Google AdWords – is a system Google has developed to assist you in marketing your products or services in the Google Search Engine, and its affiliate sites, via the use of a placed text ad that appears when people search for phrases related to your offering, this appears as a “sponsored link”. We will help set-up your account and create the first ad. Yoast – The most complete SEO plugin for WordPress available today offers you everything you need to optimise your site. Google XML sitemaps – A plugin that generates a sitemap of your site which makes it much easier for search engine bots to review your site, which is important for SEO. Another feature is that it notifies major search engines when new content is added. Super Cache – Speeds up your site, one of the things Google looks for is a fast loading site. No Ping Wait – Every time you publish a post, it pings the internet which means you can be found quicker. Google is creating new algorithms all the time. Search engines are constantly changing and evolving; they are consistently refining their techniques and algorithms to supply the best, relevant results to your searchers. That is the reason why we stress to our clients that SEO should be considered a marathon instead of a race to the finish line. 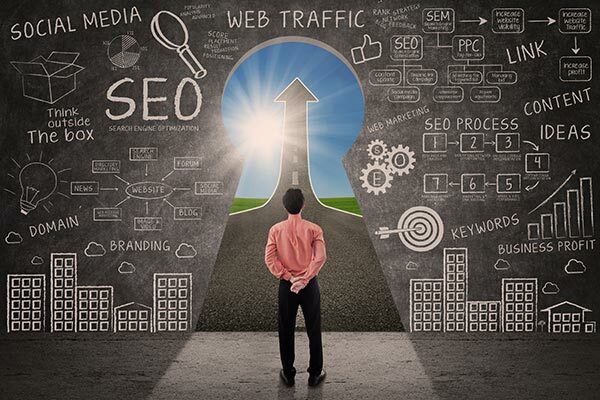 Using legitimate and effective SEO strategies will deliver more impressive and lasting results. Ensure you write unique, valuable and relevant content for your site, it will increase your chances ranking higher than your competitors. You must make sure to use your targeted keywords in the content. Around 400-500 words per page is what Google prefers. Consistently update your website and your Google+ account for better SEO ranking. Social media – lots of tweets and posts to show Google your business is popular and active. Every time I meet a possible new client, the first thing they ask me is how much, but then they follow with ‘just don’t spend too much time on it’. Now how is any designer going to be able to get inside a client’s mind? We just can’t presume or guess. We need to understand our client’s motivations, what makes them tick, what are they thinking. We need to use a design brief! A design brief is a document which has a series of questions which we ask our client to better understand what they envisage their logo or website will look and function. It plays a pivotal role in guiding both us and the client to an effective outcome. There may be stumbling blocks that crop up along the way – our client may disagree with a decision we have made. It’s at points like this when we can return to the details of the brief to back up your stance. That’s not to say you won’t make design changes as a result of a disagreement – you want to please your client, after all. But the design brief exists to provide both of you with concrete reasons for making decisions throughout the design process. Below is an example of a website brief we use for our clients. Have a look to see what I am trying to explain. The development brief provides potential web developers with sufficient information to base a proposal to undertake the development of the website. A good brief contains enough detail for external web developers to provide a firm quotation. Quite often it will just enable them to provide an approximate quotation which would be confirmed in the first stage of the project once they were appointed. Below is the outline of a typical development brief adapted from the Australian Government’s e-strategy guide website. Be as specific as possible about the target audiences for your site. Provide as accurate a breakdown of the demographics as possible, e.g. gender, age groups, location (state, national, international, rural, city), interests. Provide some assessment as to their likely experience using the internet. Provide any relevant history of the project and/or the organisation that would assist developers to understand people and content sensitivities, schedule, design, aims of the organisation etc. used in the site and how they relate to each other. Identify the functional elements that are to be included in the site. Describe in as much detail as possible how you envisage each function will work from the user’s perspective. Include what results or information you want and what tracking you want to be able to do when users access that functional element. For example, for each online form stipulate how many fields of information, what information is sought, to who in the organisation the information supplied is to be sent and in what format. For example will it be an email with the text or is it to go automatically to a database or other program? organisation’s existing branding (logo, font, colours) or is it purposely different? look of and those you don’t. fast download (users become intolerant of waiting for images to appear). Speed – the optimum speed and any special factors that may impact on it. the internet – e.g. rural clients with limited access speed and capacity. disclaimers etc) are to be displayed to users. Who will need to be trained from your organisation? Over what period will testing take place? – at the beginning, during and/or just before launch? Who pays for changes that are required as a result of feedback from the testing? What’s the deadline for the site to be up and running? What is Good Graphic Design? To understand and know what good graphic design is or know why some designs work and others don’t you need to know about the basic elements and principles of design. Elements of Design Lines, Colour, Type, Imagery, Texture Lines are used to direct the eye and create forms. Basically, lines are found in layouts to separate content, such as in magazine, newspaper, and websites. Colour is an important element in design, it can be used to make an image stand out, to evoke emotion. Type, is all around us. In graphic design, the goal is to not to just place some text on a page, but rather to use it effectively for communication. Choice of fonts (typefaces), size, alignment, color, and spacing all come into play. Imagery (Art, Illustration & Photography) A powerful image can make or break a design. Photographs, illustrations and artwork are used to tell stories, support ideas, and grab the audience’s attention. Texture refers to the actual surface of a design or to the visual appearance of a design. In the first case, the audience can actually feel the texture, making it unique from the other elements of design. Visual balance comes from arranging elements on the page so that no one section is heavier than the other. Are your page elements all over the place? does each portion of the page balance out the rest? Closeness creates a bond between elements on a page. How close together or far apart elements are placed suggests a relationship (or lack of) between the information, i.e. Are title elements together? Is contact information all in one place? Brings order to chaos. How you align type and graphics on a page and in relation to each other can make your layout easier or more difficult to read. Is there a common alignment — top, bottom, left, right, or centered — between blocks of text and graphics on the page? Repeating design elements and consistent use of type and graphics styles within a document shows a reader where to go and helps them navigate your designs and layouts safely. i.e. do page numbers appear in the same location from page to page? Are major and minor headlines consistent in size, style, or placement? Have you used a consistent graphic or illustration style throughout? Helps different design elements stand out. Is there enough contrast between your text (size and color) and background (color and pattern) to keep text readable? Is everthing all the same size even when some elements are more important than others? Designs that try to cram too much text and graphics onto the page are uncomfortable and may be impossible to read. White space gives your design breathing room. Do you have enough space between columns of text? Does text run into graphics? February 5, 2015 admin Graphic design, Graphic Design Adelaide Comments Off on What is Good Graphic Design?